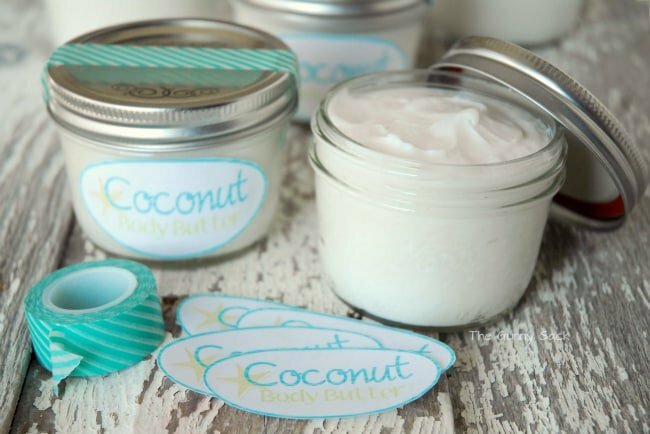 This coconut body butter recipe is the perfect Mother’s Day gift in a jar! 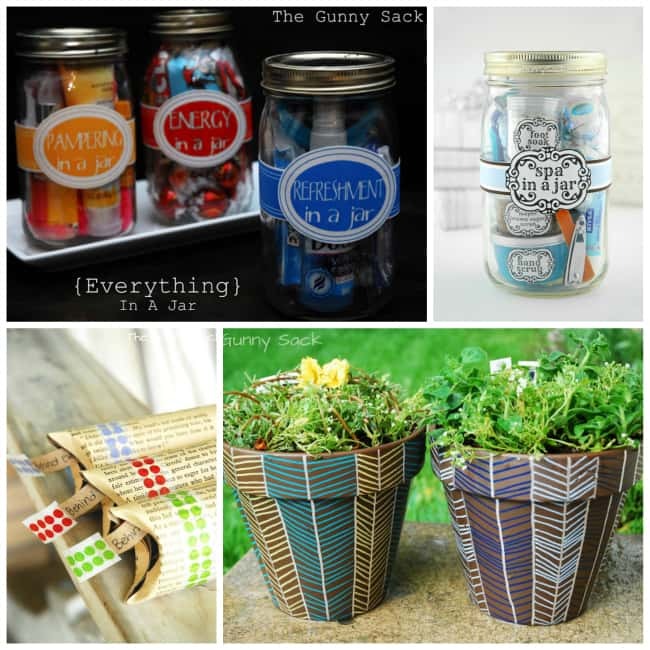 It could be given alone or in addition to another handmade Mother’s Day gift like a Spa In A Jar. I love making gifts in a jar and with Mother’s Day on the way, I wanted to make a Mother’s Day gift in a jar but wasn’t sure what to make. Then, I came across a Pin from Katie at The Crafty Blog Stalker for making your own lotion and knew it would be a perfect gift! What mom couldn’t use a little pampering and with summer on the way we all want our legs and feet feeling soft. I didn’t follow the recipe exactly and my body butter ended up being rather expensive but not nearly as expensive as the $20 body butters you find at Ulta. I wanted to use Bath and Body Works lotion because I love the scent. But I’ve noticed that the basic Bath and Body Works lotions aren’t very moisturizing. By adding in the Vaseline and vitamin E cream the moisturizing factor went way up. 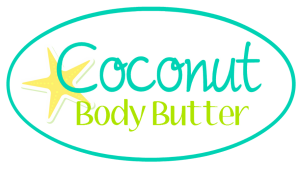 A little of this body butter goes a long way! I used one Net Wt 7.5 oz jar of Vaseline Cocoa Butter petroleum jelly, three 8 fl. oz bottles of Aruba Coconut body lotion (bought it on sale) and two Net Wt. 4 oz jars of Studio 35 Vitamin E cream. I got the vitamin E cream from Walgreen’s. It would’ve been way cheaper at Walmart but since it was snowing like crazy, I didn’t want to drive 30 miles to Walmart. I wanted to try using coconut oil but I couldn’t find it at any of the stores in my area. I thought it would be at one of the grocery stores that carries a lot natural products but it wasn’t. So, once I do find it, I will make another version! 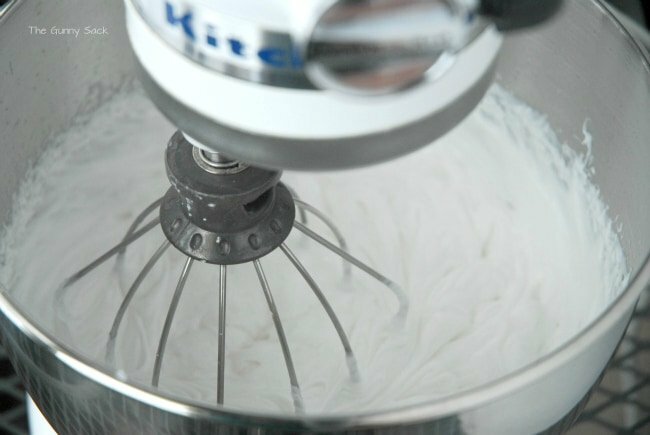 I put all of the ingredients into the mixer and whipped them together. I made a cute little label to put on the jars using Ribbet. I was so excited to see that Ribbet FINALLY has a BLANK CANVAS option! Woohoo! That means you can start with a plain white background (or any color for that matter) and add pictures and text to it. I made my own blank canvas a long time ago and have been using that but THANK YOU Ribbet for putting this on your website free of charge. To print, I opened a blank Word document, inserted the image, resized it and then copied and pasted until I had 6 labels on the document. I filled six 8 oz mason jars with the body butter. As you can see, my printer has decided to think outside the box and the colors of the labels didn’t print like they were supposed to so just pretend that they look exactly like the printable above. I put a strip of aqua striped washi tape across the top of the jars and attached the labels with glue spots. Now they are ready to give as gifts! Except for the one that is on my bathroom counter and is already being used by me. Besides giving gifts to our moms and my kid’s Godmothers, I like to give Mother’s Day gifts to my friends to let them know that I think they are doing a great job raising their kids. But since I only have six five mason jars of coconut body butter, I will have to make some more or find another gift to give some of them. I would love to hear if you have tried making your own lotion. You can leave me a link in the comments or just tell me know you did it because I really want to try some more recipes! If I do try your recipe, I will give credit to you with a link to your site or if you don’t have a site I will mention you by name. 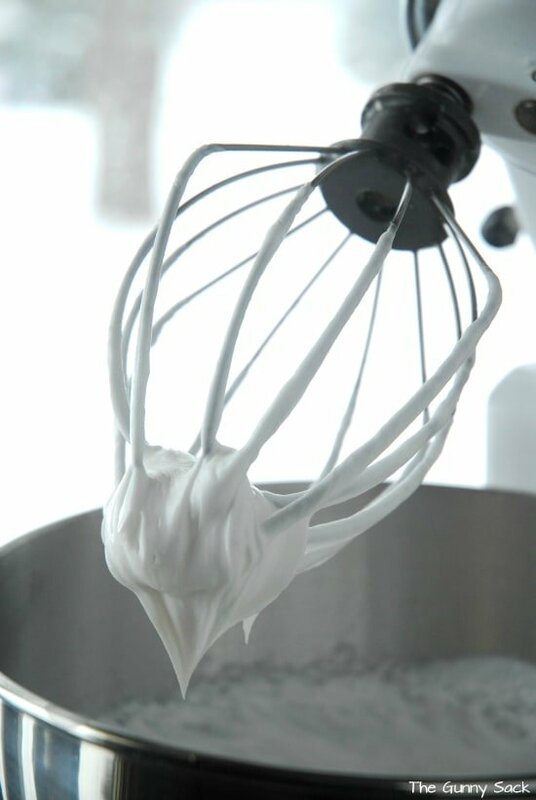 Put all of the ingredients into the mixer and whipped them together. Fill six 8 oz mason jars with the body butter. Add a strip of washi tape across the top. Attach a label to the front. What an amazing share Tonia!!!! 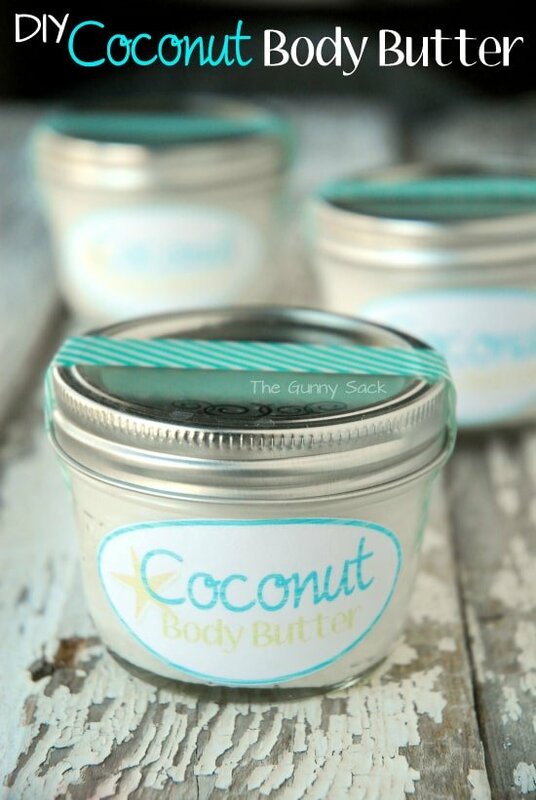 Can you please share where you got your body butter jars from? I’d like to make a bulk purchase…Thank you! I made the body butter as well as the scrub for all my family and friends for Christmas and they loved it and are requesting the body butter for this year. I would like to try using Coconut Oil but not sure what I would substitute it from the original ingredients. The Body and Bath ingredients? It depends on if you are trying to make it more “natural” or not. I would try using the coconut oil in place of the Vaseline in this recipe. You can start by whipping the coconut oil and then add the other ingredients. Start by adding less of the vitamin E cream and Bath and Body Works lotion and see how it goes. Add more as you go along. Unfortunately, I do not sell this body butter. Instead, I shared the recipe so that you can make it the same way I did! Best of luck! 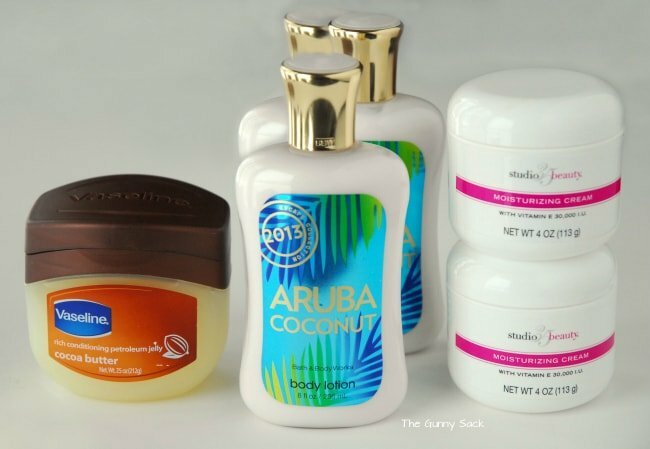 Where did you get the Aruba coconut body at and how much did it cost? I bought the Aruba Coconut body lotion for Bath and Body works but it was a seasonal scent so it is no longer available. Their lotions cost $11.00 when not on sale but there are always deals on their lotions. They have other coconut scents though like Exotic Coconut and Coconut Lime Breeze. You can substitute any lotion, by any company, in any scent, if you want to. Thanks for stopping by! Tonia, The coconut oil should be in the grocery store near all the cooking oils, if they have it. so you may have to hunt for it. Also went to the Katie Crafty site and will try her recipe also. I come from holland so excuse me if i don’t say it right. While I was reading your site, I was amased of the stuff you can do with things you have at home. The only problem is we don’t have baking soda in holland, I’d love to make some soake en scrub! But I did make the butter. I love to make this it was so fun to do! The receipe i did change in what was available. I used moisturize, dead sea creme, Q10 bodylotion and vaseline. It smells greate!!!! My skin is smooth en soft. I compared it whit a butter who I already had en my own is better! Another things I did make was a sack with Lavender bath salt and lavender flowers, I used a organza bag so you let it soak in your bath and the salt will solve and the flower will be stored in the bag but will give smell to the water. Maybe when i find the bakings soda and epsom salt I will make the Bath salt myself! And look on your site how to do that!! Keep up the nice ideas!! 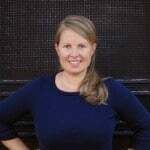 HI Tonia, First thank you for the recipes and the wonderful gift ideas. I have a question about the size of the Vaseline and the 8 oz. jars. 24 oz of Aruba plus 8 oz of Studio 35 plus less than an ouce of Vaseline, would be almost 33 oz. Does the whipping increase the volume that much?? Just wondering. Also do you think 4 oz jars are too small to make a nice gift, when added with the foot soak (4 oz) and hand scrub (also 4 oz.)? Thanks again so much for all of your hard work and creativity. Great idea! I love just about anything with the smell or taste of coconut – glad I found this! Love this idea and I have some deserving friends who would just love this! I have coconut oil. Which ingredient would you replace with the coconut oil? Oh yum Tonia. This looks good enough to eat. 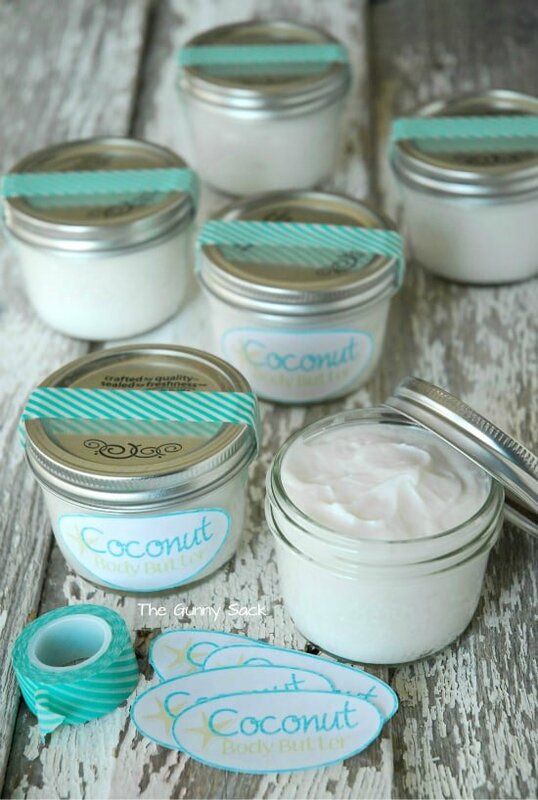 What a great idea to make your own body butter! Love that you used the kitchen aid to whip it up 🙂 The jars are so cute!!! Love this idea! So cool! Thanks for posting. Thanks Marcie! I love how it smells! I love this idea Tonia! Great question but I really don’t know the answer. It seems like it would have a long shelf life because all of the ingredients have a long shelf life. Nothing perishable was introduced. That being said, the ingredients might start to separate as time goes on. Since this is my first time making it, I will just have to wait and see. If any of you reading this post have experience with making lotion like this and can chime in, I would love to hear how long it has lasted for you. I made something similar to this several years ago with baby lotion, vitamin E cream, etc. and gave them as gifts. We moved and I forgot all about this concoction until about a week ago I found an almost empty jar in the bathroom and was still good as new..Have been using it so I can have the jar!!!!! I too have made something very similar to this that was called moisture cream. A nurse gave me the recipe, and it does last for years. All ingredients come from the dollar store. 1 8 oz. baby lotion, your choice of scent. 1 7 or 8 oz. Vaseline, 2 6 0r 8 oz. vitamin e cream. Put in blender, or mixer and mix. (mix well) I just took the labels off the cream jars and used those bottles for mine. Sounds great! What a sweet thing for your nurse to tell you! Oh this is such a perfect gift idea and I’m crazy for coconut. I need to find some of those small mason jars. The only ones I’ve been able to find are huge. I just bought some half pint jelly jars at WalMart yesterday. Last year (haven’t seen them this year) I bought some jars with designs on the lid at WM….You’ll find them in the “canning” section but you need to hurry. They’ll quit carrying them pretty soon. Hardware stores sometimes carry them, too! I bet it smells amazing!! That is perfect! I need to send you some!